SFRevu gives some serious love to Winter Children and Other Chilling Tales! The following stories really stand out as unforgettable masterpieces. In the enticing novelette “Home and Hearth” a wayward teenager goes back home after being cleared from a terrible accusation. Described with cold realism, the hidden horror gets finally revealed with sudden ferocity.”The October Widow” is a spellbinding, perfectly crafted story of witchcraft and revenge apt to chill the reader to the bone. The title story, “Winter Children”, an extremely dark and unsettling piece, tells us how a young woman troubled by the memory of her murdered sister at last meets the assassin in a final, tragic confrontation. 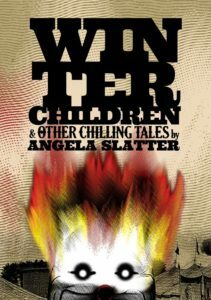 This entry was posted in News and tagged angela slatter, horror, ps publishing, SFRevu, Winter Children and Other Chilling Tales. Bookmark the permalink.